It’s Day #4 of our super-paced European and UK trip. 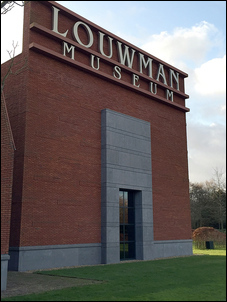 Right now we’re in The Hague in the Netherlands, and today we went to the Louwman museum, perhaps one of the world’s best car museums. 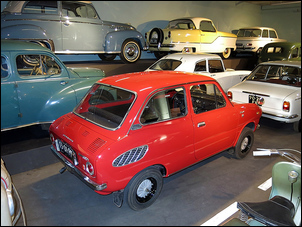 The original creator of the museum was – of all things – a Dutch Dodge dealer, who in the mid-1930s began collecting cars. The end-point, some 80 years later, comprises over 250 cars – and, perhaps even better than that, an incredible collection of ephemera on all things car-related. What things, then? Well try paintings, sculpture, ceramics, lights, horns, children’s toys and trophies. And then there are the cars – from the very oldest, to the exotic, to the humdrum… and everything in between. It’s actually rather hard to describe the collection - when there’s a Plymouth Superbird, a Honda S800, a Toyota Corolla, assorted 1930s exotic Mercedes, miscellaneous Cords, a heap of Bugattis… the variety of cars just goes on and on. The signs are excellent (in English and Dutch) and all the cars deserve their places in such a glorious collection – every last one of the machines. However, I thought that there were two aspects that detracted from a perfect museum score. The first was that there were too many cars for the space. When you see a be-winged Plymouth Superbird – probably the most extraordinary muscle car of all time - shuffled to the back of a display of racing cars, then you know that space is at a premium. Secondly, I thought that a thematic approach could have been better used. 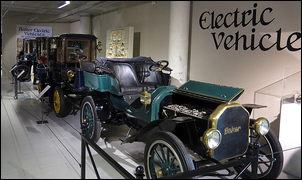 The gallery of all-electric cars was great; similarly with the steam cars. The two hybrids – a recent Toyota Prius and a 1917 Woods hybrid – were wonderful juxtaposed. However, many galleries appeared to have no theme, and so it was hard to keep mental pace with what could be seen before one’s eyes. 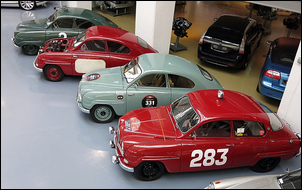 Still, without any doubt, this car museum – that seems oddly little known – is one of the world’s best. 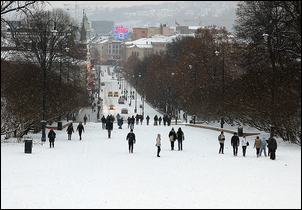 Three days ago we flew into Oslo, Norway. 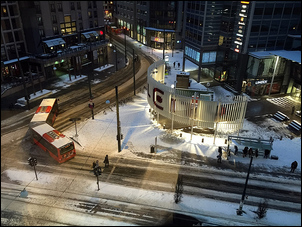 Even though we were primarily interested in going to some museums in Sweden, Oslo was picked as the entry point to northern Europe as there were more connecting flights from Dubai (and so, in turn, from Australia) into Oslo than the nearby alternatives. 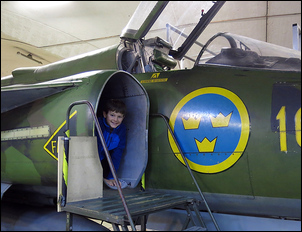 We went to Gothenburg to visit two museums – the Volvo museum and the Aeromuseum….the Aeromusuem first. The Aeromusuem comprises an enormous – and I mean enormous – underground series of tunnels, used primarily during the Cold War to house a Swedish airforce squadron. The underground base was de-commissioned only about 15 years ago, and so is in as-new condition. 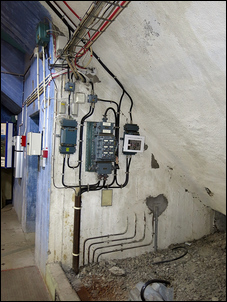 The ventilation system, the curtains, the steel blast doors – all designed to protect from nuclear attack – appear to be in perfect working order. Even the doors to what are now the public toilets are steel and are skirted with rubber to provide a seal against airborne contaminants. I found this museum quite fascinating – there could have been nothing in it at all and I would still have loved it. But there were in fact lots of aircraft inside the tunnels. As you might expect, there were plenty of 1950s – 1980s Saab jet fighters, but also helicopters, ultralights, and even pre-WWII civilian aircraft. The website for the Aeromuseum understates its attractions quite substantially: this a must-visit place. The next day we were back in Trollhatten, the location of the Saab museum. 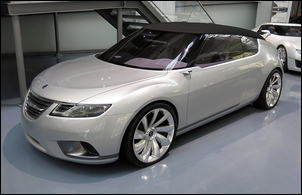 While today everyone under the age of 40 likely dismisses Saab as a rather wanky car brand that in the end went broke, that is to vastly underestimate the maker. Not only did they invent mass-produced turbocharged passenger cars, but they also produced sporting sedans that were once outright world leaders. 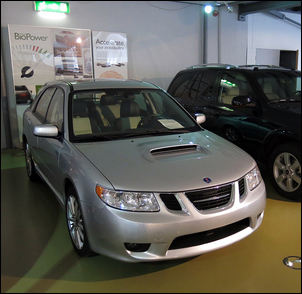 The Saab museum, while not huge, is surprisingly flash with good architecture and an excellent display of the marque. 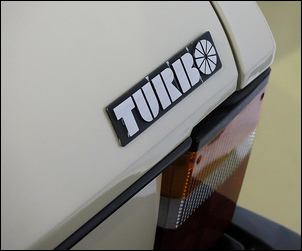 They have the first Saab prototype (a car that out-Porsches Porsche in curvaceous elegance)…. 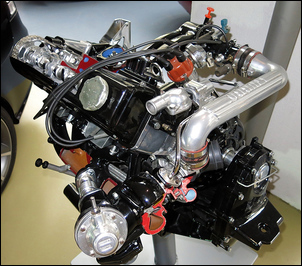 …and an excellent display of Saab engines (Saab was probably more eclectic than any other maker in the world over the same period, producing everything from a two cylinder two-stroke, to a V4, to a straight four with DOHC and a turbo); and a series of fascinating factory prototypes. But it’s also all rather sad, seeing the intrusion into the model architecture of General Motors as the (then) new owner, and Fuji Heavy Industries having sufficient influence that caused re-nosed Subarus to be sold in the US as Saabs. From there we went back to Gothenburg to visit the Volvo museum. We were running a bit behind time, so we had only two hours to do this museum – at a pinch, this was just sufficient. The Volvo museum is a damn good one. Why? 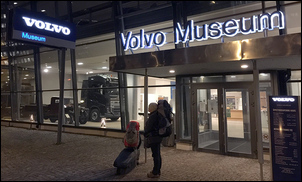 Well, rather like the Mercedes museum in Stuttgart, Volvo feature in their museum all their products – from dump trucks to cars, from diesel buses to marine engines. 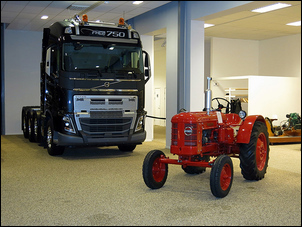 In fact, the foyer of the museum included a tractor and prime mover! 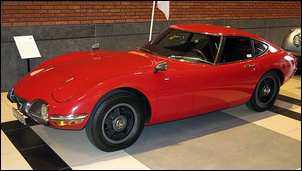 So unlike, say, the Porsche museum, there’s no gilding the lily in terms of what the company actually produces. Secondly (and this is again like the Mercedes museum), Volvo understands that cars are produced within a social and engineering context. 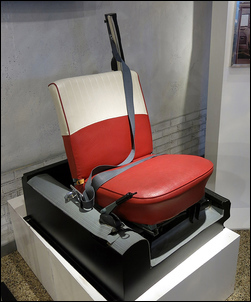 As a result, there was plenty of discussion of how societal trends influenced engineering and product design outcomes. And the culture and society of these northern European countries? We are impressed – the infrastructure is good, the people friendly and polite, the economies are obviously in good shape, with plenty of building going on. From a demographic perspective, I was surprised at the low population densities in southern Norway and Sweden, and the abrupt increase in agricultural intensity (and commensurate reduction in housing size) once we reached the Netherlands. 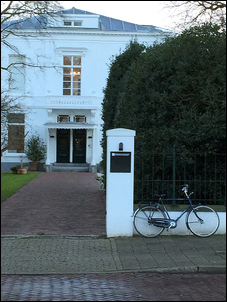 But in the Netherlands, more than anything else, it has been the bicycle culture that has bewitched us. There are bike lanes everywhere, and at any city block you see literally dozens of cyclists (of all ages) riding past. Today we waited at a bus stop and watched cyclist after cyclist ride into a local suburban garden centre to buy their plants. The bikes are staid and sensible, with upright riding positions, big wheels and mostly hub gears. Sure, the country is dead-flat, but I think it’s the cultural difference that is most profound in this aspect. And, surprise, surprise, people look pretty fit too…. 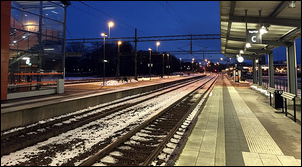 Each of these countries we have briefly visited – Norway, Sweden and the Netherlands – are ones we’d be delighted to revisit in much more detail. 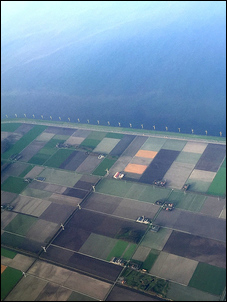 To Australian eyes, all of the housing in the Netherlands, Sweden and Norway looks rather cramped. Back yards are at a premium and, even in rural Sweden where the houses were bigger, a typical Australian house is still vast in comparison. Here in The Hague, public transport is surprisingly difficult and expensive. A ‘day pass’ (that we bought) was of little use – not when there are multiple bus companies (each of which do not accept the other companies’ tickets) and where travel even 30 minutes outside of the city is not included in the ticket. 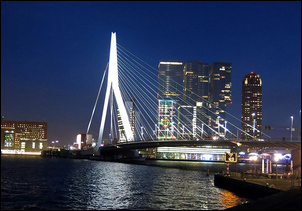 We took the train to Rotterdam to see the wonderful Erasmus bridge, and embarrassingly got trapped in the train station when our tickets proved to be the wrong ones for a swiping exit. The SOS button and some discussion on the intercom got the gates released for us, but to get the 30 or 40 kilometres back to the hotel cost us 18 Euros – and even then, buying the tickets from the machine was so complex we needed to get help from local hotel staff. Next: we’re off on a flying visit to a museum in Germany. Huge range of cars but could be better curated. 2 hours. Lovely bridge, good dusk walk, 1 hour. 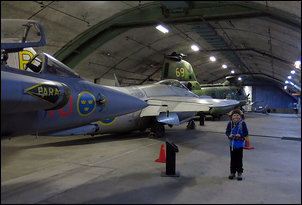 Fascinating underground aviation museum with lots of hands-on activities. 2.5 hours. Excellent single brand museum showing the startling technology breadth of this ultimately unsuccessful manufacturer. 1 hour. 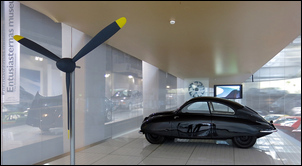 Intelligent, socially aware museum of a manufacturer with great strength of purpose and vision. 2 hours.